Make a contract with me as we take a look at a relatively new anime called "Puella Magi Madoka Magica," and see what all the fuss is about. For those not familiar, the idea of “magical girls” is sort of a staple in anime – it’s a bit of a twist on the more traditional “superhero” story you see more often in western media. The basic idea is similar: person gains some sort of super-power and secret identity and has to fight bad guys/evil while trying to balance a normal life. The basic premise of a magical girl story has the potential for a lot of interesting development, character growth, and so on – although it can also be used as just an excuse to have characters dress up in cute costumes. Madoka Magica is… not like that. At all. This is a series that is very hard to describe without spoiling things – A LOT – but I’ll do my best, because it really is worth watching without knowing the spoilers. The basic premise here is that our main character, Madoka (and her friend, Sayaka) are suddenly asked if they want to become magical girls by the weirdly cute (but also somewhat creepy) talking cat-like creature Kyubey. In exchange, he will grant them any one wish they desire. Getting any one wish you want granted in exchange for magic powers, a secret identity, and the duty to battle evil sounds like a not-too-bad trade, but this series really explores the depths of this seemingly inconsequential plot device. Consider: should you be “selfish” and make the wish for yourself only, or use it to grant someone else’s desire – someone you care about? What if your wish turns out to not be what you want – or what the person you care about wanted? The price of your wish may turn out to be more than you can bear. The characters in this series are very well developed – each one has a very interesting back story and motivation (which for the most part is filled in slowly with hints and suggestions, rather than being spoon fed to you), and they all grow and change over the course of the series. So if you’re a bit tired of the usual fare in this genre of anime, or if you’d just like to see something that really twists your mind (and your heart!) and explores some very deep concepts in a new and interesting way, I’d highly recommend that you give Madoka Magica a try. A bit of a surprise this time: a review of a relatively new anime. I don’t normally catch new anime, I usually only hear about it much, much later, when it’s had a chance to become well known. Waiting in the Summer (or Ano Natsu de Matteru) is a very interesting series – it starts with a bit of a “wham” episode, throwing a lot of stuff at you all at once. In fact, some of the stuff in the first episode seems like it’s there only to catch your attention and make you stick around for the rest… but that’s not that unusual in and of itself. What’s unusual is that it throws all this stuff at you in the very first episode, and then takes its sweet time bringing it all to fruition. This show actually plays with some of the tropes common to anime in general; for example, after a few episodes you would be forgiven for thinking that this was beginning to look like another “harem” anime series. Likewise, after few more episodes you’d be forgiven for thinking that certain relationship-based tensions (the classic “UST“) were going to be prominent for the rest of the series, and never be resolved until the very end of the show (if that). However, each time the series looks like it’s about to go down one of these roads, it will make an abrupt left turn at the last minute and genuinely surprise you. For example, like any typical anime, this one has the obligatory “beach” and “festival” episodes – but instead of being filler (as they so often are), both of these were actually highly relevant to the main plot of the series, and in a way that felt genuine & not contrived at all. That’s something that can be hard to pull off effectively. Suffice to say I was surprised several times – and that’s a hard thing to do to me these days. So the premise is interesting, and the story is refreshingly different – or at least genuinely surprisingly unpredictable. The animation, on the other hand, is nothing to write home about – it’s certainly quite good, but nothing groundbreaking. At the moment, this is available only in subbed format – as far as I know, no English dub exists yet – and can be watched (legally!) on Hulu for free. All in all, this is an entertaining series. It may leave you pining for your adolescence, or it may make you glad you’ve left those days behind you, but either way it will probably surprise you, and maybe even make you smile (or blush – often, as it did with me). If you enjoy anime, I definitely recommend it. Keith reviews "The Girl Who Leapt Through Time" - because who doesn't love stories about time travel? What would you do if you had the ability to go back and relive moments in time? This is the basic premise of the anime The Girl who Leapt Through Time, a story of a girl (Makoto) who suddenly finds herself with the ability to “leap” through time. This anime takes a slightly different approach from some other time-travel stories, in that it’s less about the actual traveling through time aspect (or how it’s done specifically), and more about the consequences of having such an ability, and how it can affect the people around you – as well as yourself. This is an amazingly detailed and thought-provoking anime – so much so, that it could just as easily have been a live-action film (although the larger budget needed for that would probably have precluded it being made in the first place, so let’s be glad it was made as an anime). Makoto is a pretty normal high school student – a teenager – and even when she gains the ability to “leap” through time, she still acts like one. Think about it – what would you do if you suddenly found you could jump through time as a teenager? Spend all of your money? Go back in time and get it all over again. Don’t like what’s for dinner? Jump back to yesterday when you had your favorite dish. Do bad on a test? Jump back after getting the answers back and do it again. This is precisely what Makoto does – at first – when she gains the titular ability. However, after a while she starts meddling in other people’s lives – trying to help them out. She’s not malicious or spiteful, she genuinely wants to help her friends and classmates, and she tries to use her power (and her Groundhog Day-like power to know how things will turn out) to make things better for them. Unfortunately, she’s not very good at it, and she also comes to realize that there are limits on her power – making a perfect day for herself is easy, but trying to make things come out perfectly for everyone you know is much, much harder. Many times she screws things up terribly, and has to jump back in time just to un-do things. Eventually, she thinks she’s gotten things as good as they can get (more or less), but that’s when she discovers another limit on her time-leaping powers… as well as a personal consequence of her use of those powers that is maybe a bit more than she can bear. The animation is great – as befits an animated feature-length film – and at no time do things look stereotypically “anime” or cutesy for the sake of being cute. There are a few moments of CG animation cut in, which looks… jarring, to say the least; but these scenes are kind of supposed to be jarring, so it isn’t totally out of place. The soundtrack to this anime is, quite simply, incredible – subtle and wistful at times, it really helps set the mood. There’s no pop or J-pop music in this soundtrack – instead, most of the music is classical or just subtle, atmospheric instrumental. 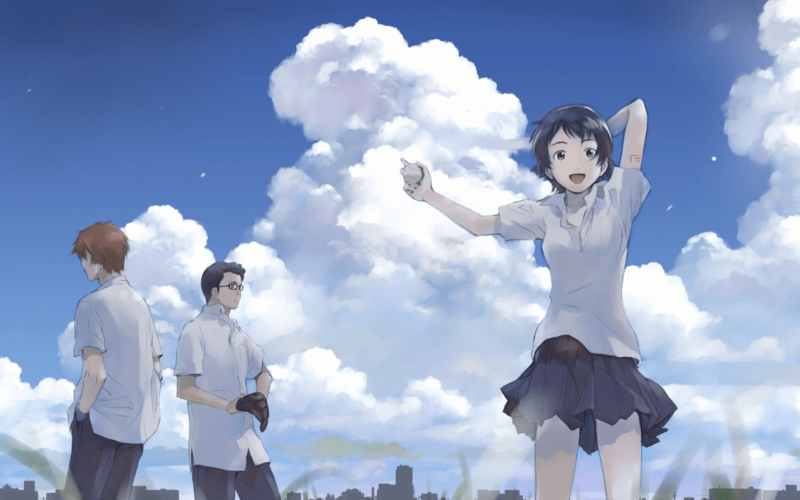 In the end, The Girl who Leapt through Time is an absolutely fantastic anime – no, scratch that… it is an absolutely fantastic movie (which just happens to be animated), and one that I think anyone would enjoy. Although it involves time travel, it is not sci-fi or anything; just a solid, timeless, classic, sometimes heartwarming, sometimes heart-wrenching story. Keith reviews the (relatively new) anime series K-ON! and finds it so good that he can't stop smiling the whole way through! The premise of K-ON! 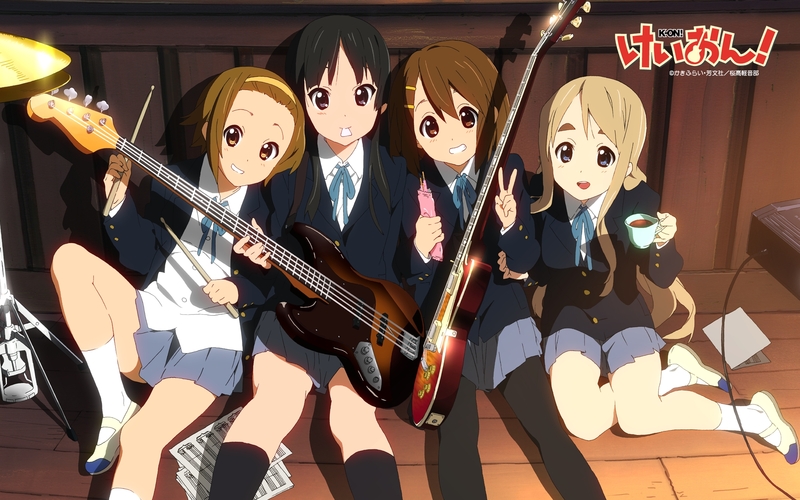 is quite simple – a couple of high-schoolers join the “Light Music Club” (the Japanese name of which is where the name “K-ON” is derived from) and play music, form a band, have adventures, drink tea, and generally goof around all the way through high school. Overall, K-ON! is a very lighthearted series, with a recurring theme of the value of friendship and being yourself. It really is just a lot of fun to watch; you can’t help but smile while watching it. Another aspect that makes this series very enjoyable to watch is the music, which is simply fantastic (as you would expect about a series about people in a school music club that form a band). Everything from the opening theme to the closing theme (which is usually done in the format of a music video featuring the main characters), along with every song that is performed in-series is just terrifically upbeat and catchy, and you’ll undoubtedly find yourself humming one (or more) of the songs at some point. Ultimately this is just an incredibly adorable and fun series. The characters are just so much fun to watch as they interact with one another, and there’s a nice mix of humor, sweetness, and “slice-of-life” style stories that just make it just a pure joy to watch – either from start to finish, or picking any random episode and letting yourself smile the whole way through. You won’t find anything in K-ON! that is overly dramatic, but it is a great series that is just plain fun to watch. I highly recommend it. Keith's review of 'Kanon' - a 24-episode journey of bittersweet sadness and incredibly deep stories! Kanon is a very interesting anime series. 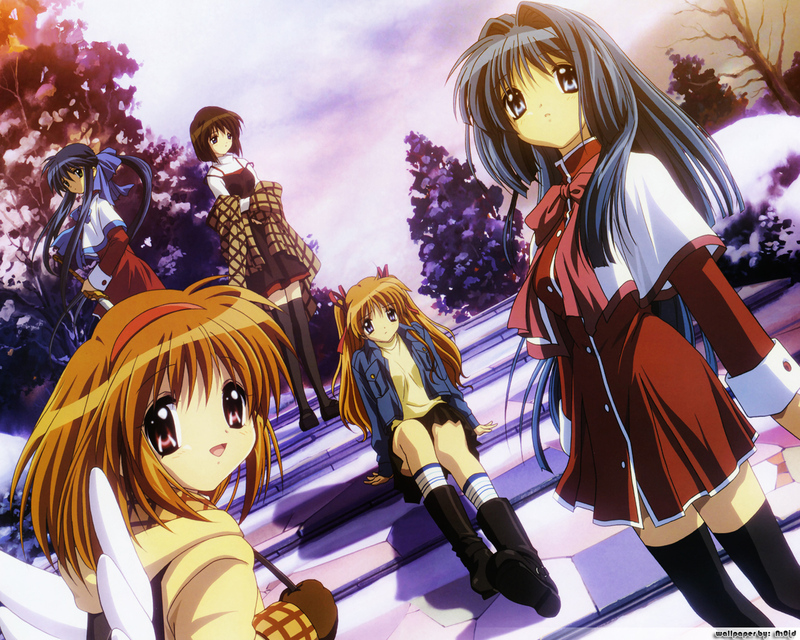 Originally released in 2002, and then re-done and re-released in 2006, this is an anime based on a game – much like Air. However, I didn’t find out about it until just this year, so once again I am sort of “behind the curve” on keeping up with the latest anime. Like the musical style it is named after, Kanon is built on recurring themes that play out (with many variations) through the different characters. There are themes of memory loss, timeless love and affection, the struggle against the inevitable, along with many more – but you should just watch the whole series to find them all. One of the reasons I like this series so much is the cast – or perhaps I should say the depth of the cast. Instead of a bunch of cookie-cutter characters which simply fill some stereotypical role, each character has unique characteristics – and most importantly, everyone has a reason for those characteristics, which is eventually explained and explored along the way as we get to know the characters better. I make no secret of the fact that I’m a big fan of in-depth characterization – and Kanon certainly delivers in that department. I like finding out about characters motivations and the events that led them to be the way they are now. Even if we’re never told everything about a character, if the author has an in-depth history behind them (even if it’s just in the author’s mind), it will show, even if they don’t come right out and explain it. And that, I think, is the hallmark of a really great story, no matter how it’s told (novel, manga, or film). Shiori, a girl who seems to have some sort of serious illness (but won’t talk about it) who hangs around just outside the school and seems to have some problems at home. Over the course of the 24 episodes, each of these people’s stories are explored in-depth. And that’s just the “main” characters – there are also several supporting characters who also have their own stories, which are also explored (although they are not as dramatic and aren’t explored quite as deeply). For example, Sayuri, Mai’s friend, has her own background drama which explains why she often talks about herself in the 3rd person. I must also admit that I’m a bit of a sucker for what you might call “sappy” (or maybe “emotional” is a better term) stories – and again, Kanon certainly fits the bill. This anime is not a silly happy story, nor is it a comedy – it has a heavy dose of bittersweet sadness and regret. (Though of course there are silly happy bits, and comedic parts – and they fit very well into the overall story, which is always nice to see!) If you are the emotional type, you may want to keep some tissues nearby when watching this series. I also love the attention to detail in this series – if you’re watching it, be sure to pay attention. There are subtle clues and seemingly-random events that become relevant much later on. There is a fair amount of foreshadowing, but it’s subtle and easy to miss – it’s not in-your-face or anything like that. Ultimately of course it’s the story that will really draw you into this series – and it is a very well done story. There are several “arcs” which usually focus on one (or two) characters, and each time you really feel very connected to the characters – you care about them and want to find out what’s going on, or find out what happened to them. And that’s what I think is best about Kanon – an interesting story with memorable, well-developed characters and just the right mix of mystery, sadness, happiness, and a touch of the supernatural. If you like your anime with good, deep stories (even if “romantic” stuff is not necessarily your cup of tea) and lots of interesting characters, then I would strongly recommend you give Kanon a try – you won’t be disappointed.